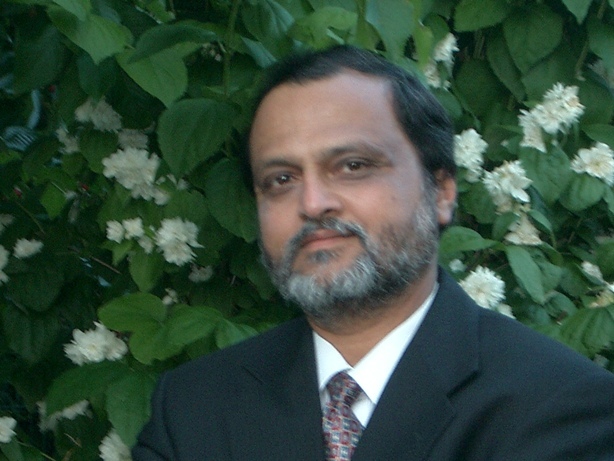 Rajendra Madhavrao Shende (born 13 July 1949) was the head of the OzonAction Branch of the United Nations Environment Programme, Division of the Technology, Industry and Economics (UNEP DTIE). He was also Review Editor for the IPCC Special report on Technology Transfer. He was also Coordinating Lead Author for the IPCC/TEAP special report] on safeguarding the ozone layer and global climate system which was part of the Climate Change Assessment report of IPCC that won 2007 Nobel Peace Prize. He has received the Nobel Peace Prize Certificate and appreciation from Chairman of IPCC and also from Executive Director of UNEP for his contribution to IPCC. He has become the first Indian to bag an award from the US Environment Protection Agency (EPA) for efforts to protect the ozone layer. Shende was born in India. He studied Chemical Engineering at the Indian Institute of Technology (IIT) in Mumbai. He began his career in1973 with Tata Chemicals, Mithapur, India as Production Engineer. In 1988 he was nominated by the Government of India on the National Task Force to carve out India’s strategy leading towards its ratification of the Montreal Protocol. Later, he was part of the India’s international negotiating team for establishing the financial mechanism for the implementation of the Multilateral Fund for the implementation of Montreal Protocol on the substances that deplete the Ozone Layer. He joined UNEP’s Division of Technology, Industry and Economics in Paris in 1992 to launch the capacity building and technology transfer programme to implement the Montreal Protocol in the developing countries. As Programme leader he set up the systems for the global cooperation among the developing countries and countries with economies in transition as well as between the developed and developing countries. He pioneered new approaches to mainstream small countries in the implementation of the Global Environmental Accords. In 1999 he was appointed on the higher post as Chief of Energy and OzonAction Unit that was the first time the Division initiated the Energy Programme. He has also organized workshops on Clean Development Mechanism in more than 20 countries under the Kyoto Protocol. In 2004 he was appointed to become the Head of OzonAction Branch, to lead the global programme for safeguarding the ozone layer and the climate system though the policy advice and support for technology transformation, and delivering the financial and technical aid to 146 developing countries through UNEP’s four regional offices in Bangkok, Nairobi, Bahrain, and Panama city to get climate mitigation benefits as well as ozone layer protection from the implementation of the Montreal Protocol. His main achievements in UNEP include the innovative mechanisms of South-South cooperation, regional networking, participatory process for developing country strategy for implementation of the Montreal Protocol, decentralized information clearinghouse, training for the customs officers, refrigerant management plans, terminal phase out management plans were some of such approaches that he developed were highly successful and became models for the implementation of other MEAs. Leveraging the Synergies between MEAs through very practical examples has been his major contribution to the coherent and coordinated governance of the environmental issues. Developing the partnerships with the industries, international organizations, academia and NGOs has been his forte. Moreover, he was instrumental in developing the bilateral cooperation with large number of developed countries to assist the developing countries for the ozone layer protection and safe guarding climate. 1.In May 2005, the OzonAction programme became first Programme in the UN system to win the award from United States Environment Protection Agency-EPA for its work on the protection of the Ozone Layer, as well as a special certificate from the President of Senegal on behalf of all African countries. The programme also received the ‘Implementation Agency’ award in 2007. 2. Shende received 20th Anniversary Montreal Protocol award for the ‘Outstanding Contribution’ in 2007. 3. The SolarChill vaccine cooler, supported by him, won UK Industry award in 2006. 4. He has received the Nobel Peace Prize Certificate and appreciation from Chairman of IPCC and also from Executive Director of UNEP for his contribution to IPCC. He also received a Certificate and appreciation from Chairman of IPCC and also from Executive Director of UNEP for his contribution to IPCC. 5. In April 2009, he won the Climate Protection award from United States EPA for his work in achieving climate benefits from the actions to protect the ozone layer. 6. In March 2010 he was honored, on the occasion of golden jubilee year of State of Maharashtra, with the Y.B Chavan Award of the Excellence in Environment. 7. In November 2010 he was awarded the certificate of the appreciation for assisting the African countries from Minister of Uganda on behalf of 53 African countries. 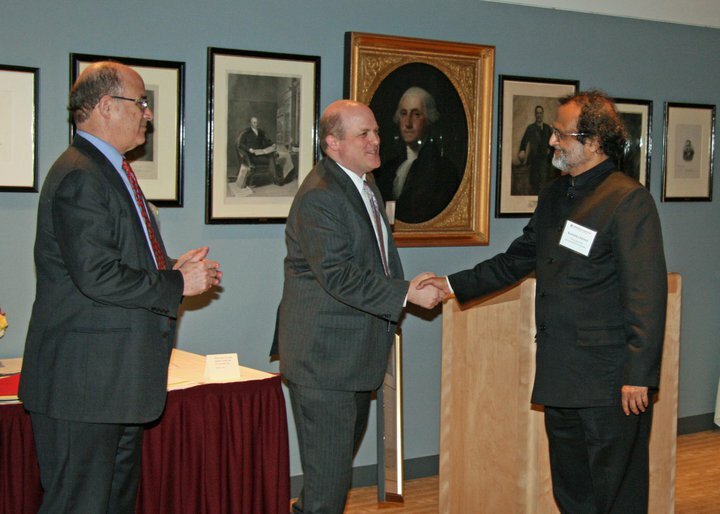 Professor Dan Schrag, Director of the Harvard University Center for the Environment congratulating Rajendra Shende, Head of OzonAction, UNEP, in presence of Henry Lee, Director, Environment and Natural Resources Program (ENRP).